On October 25, 2001: The Enron company, leader on the American market of broking in energy, dismissed its financial director because of 1,2 billion dollar of loss. On December 2, 2001: Enron placed under the protection of the law on the bankruptcies. Ten days later, Enron presented its plan of reorganization and announced a debt of 22 billion dollars. We will check the analogies of this bankruptcy in the birth chart of the “Number one” of The United States, President George Walker Bush. It is clearly understood that he is not any responsible in this event. The chart of the Presidents or the Kings can be consulted like universal chart in worldwide astrology for their countries and more still for the “World Number One”. Age : 55,30 years old. 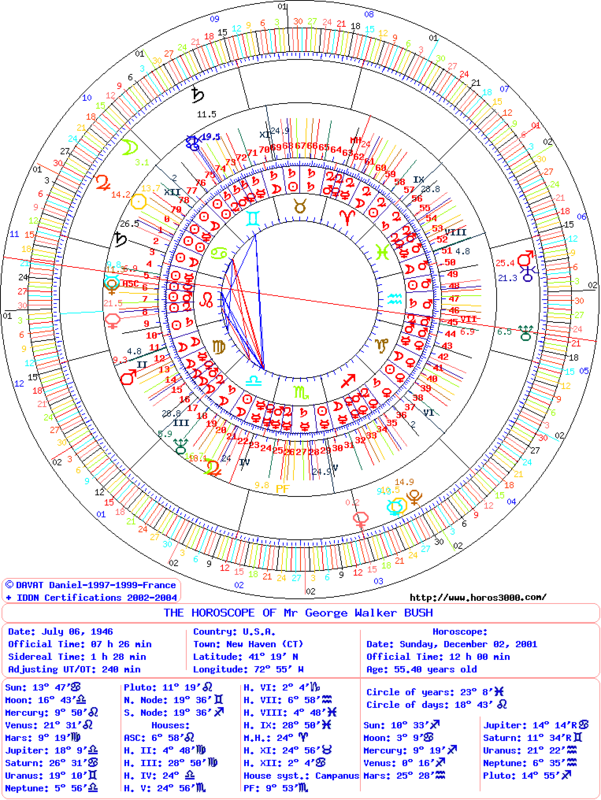 Point of convergence of the circle of the years : 22°40′ of Pisces on a degree pertaining to Venus. This sector has a feeble force (at the end of the House VIII). Position of the degree of the day: 11° 14′ of Cancer. It has a conjunction with Sun (to within 2°33′) and with Jupiter of transit (to within 4°21′). 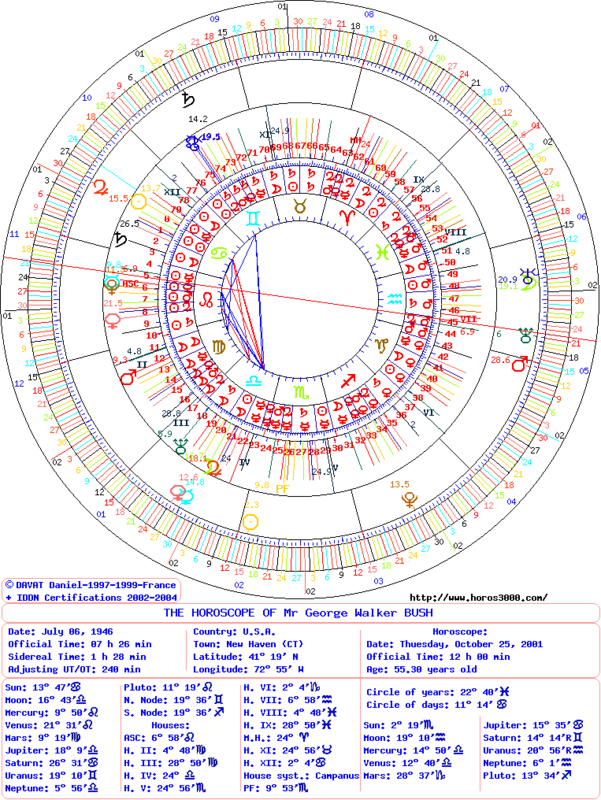 Point of convergence of the circle of the years: 23°08′ of Pisces on a degree pertaining to Venus. This sector has a feeble force (at the end of the House VIII). Position of the degree of the day: 18° 43′ of Leo. It has a conjunction with Venus (to within 2°48′). It is situated near the point of convergence of Jupiter in Leo (18°09′). The energies of the year are identical for the two dates. Saturn is the master of the period. With its natal position, it is located in the sign of the Cancer of very evil quality and very powerful force (with a conjunction with Sun and the Ascendant). Venus, at the point of convergence of the year has a feeble force. It’s Saturn the dominator. One could expect one year difficult! Indeed, after the attack of World Trade Center, occurs most spectacular private bankruptcy of the United States. October 25, 2001 – In the horoscope, it announced by the dismissal of the director financier, put in the light of the media, at 2° of the position of the natal Sun which undergoes a conjunction with Saturn, the master of the period. It is the place of the greatest tensions, it has a very evil quality and a very powerful force. This sector is also under the influence of a Jupiter transit. In Cancer, it is its sign of Exaltation of a very good quality. But it should be noticed that these energies are in House XII, that of the judicial problems and Jupiter is too governor of the House VIII, that of the end of all process. Sun-Saturn indicates that the dismissal is announced at public and the transit of Jupiter provides a temporary protection, the real losses are not revealed yet and the persons in charge are not arrested yet, nor sentenced. December 2, 2001 – The Enron company obtained a judicial proceedings of bankruptcy. This degree is under the influence of natal Venus. Venus doubly means the supports by its nature and because it is a governor of natal House XI (in Taurus). It have beneficent quality and powerfull force. It has an analogy with the solutions which can to relieve this adversity. Jupiter has a beneficent quality and a powerfull force in Leo. It symbolizes notably the judicial domain. It is determining of this legal proceedings which gave time to the Enron company to find new partners. This entry was posted on Thursday, July 12th, 2012 at 5:25 pmand is filed under Finances. Both comments and pings are currently closed.